Fully electric machine to cover clamp forces from 2,150 kN(220 tf) to 4,410 kN(tf). While emphasizing cost-performance, excellent stability in molding is attained. 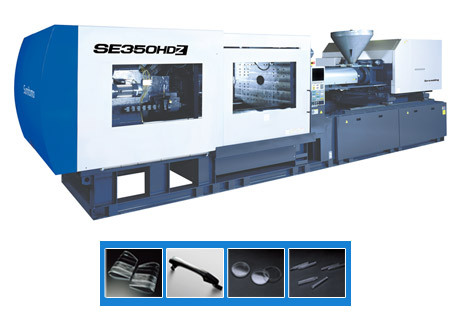 The new mid-sized SE-HDZ Series all-electric injection molding machines, 242 to 496 US tons, were specifically designed for high-duty applications such as thick parts and parts with cycle times in excess of 15 seconds. With the SE-HDZ, you’ll find high hold pressures, up to 31,718 psi, that exactly match the injection pressures. For large part molding, there are also high injection capacities, up to 75% greater than a typical machine. Equipped to deliver full power for up to 40% of the cycle, this machine series ensures exceptional stability, outstanding machine durability and the ability to handle even the toughest high-duty application. The all-electric SE-HDZ features four, Sumitomo-built, AC servo motors with digital-to-digital, closed-loop control. All four motions — plasticizing, injection, clamping and ejection — are controlled by these motors. Using highly energy efficient servo motors, the SE-HD draws power only as needed and provides significant, quantifiable energy savings. Demand on cooling systems and expenditures related to hydraulic oil and filters, oil clean-up and disposal are reduced. Combined with the exceptional precision repeatability and cycle time optimization of these machines, the result is less cost and higher yield for improved overall productivity. The SE-HDZ is backed by Sumitomo’s comprehensive Customer Satisfaction Program which includes the industry’s best warranty program, worry-free parts, responsive field service and financing availability — plus other important advantages such as 3 days free in-plant training for new customers. Please use the SE-HDZ Info buttons above at right for more information about this new series of mid-sized high-duty all-electric injection molding machines.